The abundance and size distribution of hyaluronic acid (HA) in biological fluids is recognized as an indicator of inflammation, leading to osteoarthritis and other chronic inflammatory diseases. It can also serve as an indicator of how far the disease has progressed. Now, investigators from Wake Forest Baptist Medical Center detail their use of a solid-state nanopore sensor as a method to detect and quantify HA that could have utility for the diagnosis of osteoarthritis and many other inflammatory diseases. Currently, the most widely used method to analyze HA is gel electrophoresis, which is slow, messy, semiquantitative, and requires a lot of starting material, Hall noted. Other technologies include mass spectrometry and size-exclusion chromatography, which are expensive and limited in range, and multiangle light scattering, which is nonquantitative and has limited precision. In the current study, the researchers employed an innovative approach for the analysis of HA, which could save investigators, and eventually patients, time and money, while increasing accuracy. The measurement approach consists of a microchip with a single hole or pore in it that is a few nanometers wide—about 5000 times smaller than a human hair. This is small enough that only individual molecules can pass through the opening, and as they do, each can be detected and analyzed. By applying the approach to HA molecules, the researchers were able to determine their size one-by-one. 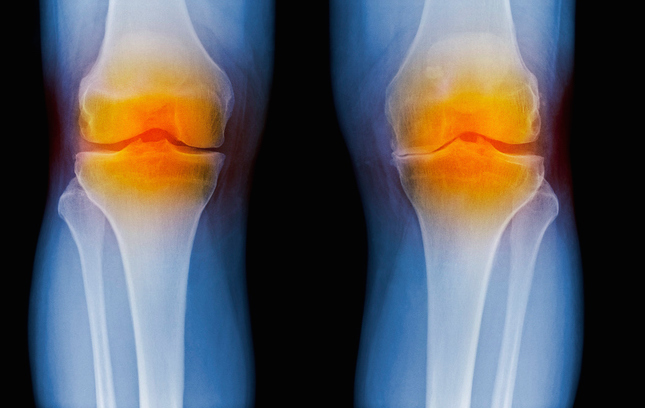 HA size distribution changes over time in osteoarthritis, so that this technology could help better assess disease progression. “By using a minimally invasive procedure to extract a tiny amount of fluid—in this case, synovial fluid from the knee—we may be able to identify the disease or determine how far it has progressed, which is valuable information for doctors in determining appropriate treatments,” Hall commented. The research team hopes to conduct their next study in humans, and then extend the technology with other diseases where HA and similar molecules play a role, including traumatic injuries and cancer. “Our results establish a quantitative method for assessment of a significant molecular biomarker that bridges a gap in the current state of the art,” the authors concluded.